Although it is weekend, the building of the town hall from Niederrohrdorf is full of life. A lot of bags, boxes, packages are discharged from few cars. Among them, it can be seen even a flag: Romania's Flag which disclose a Romanian event. We are few enthusiastic people who set up three months ago the Romanian Club Baden (RCB). This is the first event in this year, and we would like that this evening to be full of success. We are preparing the celebration of the "Martisor", one of the most famous and old traditional fest for the spring. (During the Roman Empire, it was celebrated at the beginning of the year.) The desire to celebrate this event was with us from the start of year 2006. There is a continuous activity on the staircase, in elevator and in hall. While the men are carrying and arranging the chairs, preparing the video-audio equipments and having a last view on a short documentary on Romania, the ladies are busy in kitchen with the delicious dishes which will be served later. It seems that the main things are done and everybody is living. There isn't so much time left until the event starts, so, we have to dress ourselves properly. We are impatiently waiting the evening with and curiosity. We don't know yet how many guests will attend. The organizational committee is already present, trying to finish the last details. There is the Romanian Flag at the entrance and above it one can see the symbol of the Romanian Club Baden. Two members of our club welcomed the guests with a surprise for ladies : everyone of them is getting a "martisor", a small symbol of the spring. The "martisor", this combination of red (symbolizing love) and white (symbolizing purity) colors, is believed bringing luck, happiness, health. This was a very touching moment for the ladies. After a while, the room was full of people with more than 80-90 persons waiting the beginning of the event. Mr. Alexander Vaida, the president of RCB, welcomed everybody and thanked to few persons such as Luciana Cristea, Adriana Cristescu, Tana Zamfirescu, Valentin Zamfirescu (our DJ for this evening), Claudiu Cristea (photographer) Rodin Magdes and Lucian Popescu and also to sponsors Mrs.Sonnenmoser and Mrs.Cristescu. After this moment, Mr.Vaida presented a short history of "Martisor" and the way it is celebrated in different regions of Romania, from the time of Roman Empire till nowadays. The evening become really Romanian when two special guests, two Romanian artists Mrs Ioan Calancea and Mrs Stoian Valeria from Germany (Reutlingen) delighted us with various beautiful Romanian songs. We are very thankful to these two artists and they are always welcomed among us. 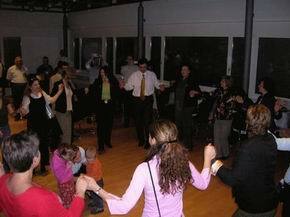 I would like to mention about the presence in this evening of few Romanian people from Serbian Banat (part of former Yugoslavia populated by Romanian native language speakers).They are still keeping the Romanian traditions and were very happy to find our club, a place where they feel like "at home". After a drink, the buffet is opened. The dance also started. The time is passing very quickly ...... Slowly, our guests are leaving one by one . CRB thanks to those ladies who prepared the delicious dishes and to everybody who contributed with their presence at this successful event. I would also like to mention the variety of cakes cooked by ladies.It was absolutely remarkable "Elvira's torte" ( made by Mrs. Szumilasz), "Tiramisu" (made by Mrs. Bontus), and no less famous the cakes made by Cristina Vaida. 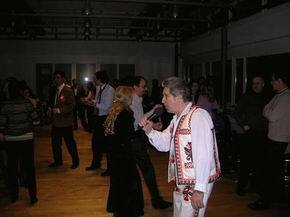 Romanian Club Baden tried to gather in a room Romanian people. This room become in that evening in fact a house for everybody who loves and wants to know Romanian values. This house has the doors open for anyone who wants to enter inside. It has to be said that without your kindness (everybody who was present and the new members) nothing could have been possible. I want to wish you a beautiful and sunny spring. 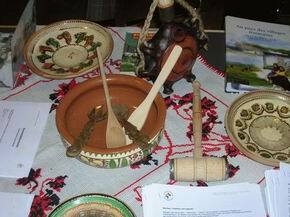 We say "Welcome" to new members and "Good-bye" to all until the celebration of the "International Nations Day" on 25th of June, where we will have a Romanian stand.